After John Halliday’s exciting excursion to Skye, we picked Relax up from the new transit marina in Oban to start the journey back south again. It seems that the Oban authorities have finally decided that allowing yachts to moor close to town is a good thing and they have even provided a new shower block albeit with more electrically operated key coded doors than wash basins! The following day we set out in a fine drizzle down Kerrera Sound and as we needed to time our passage through the Sound of Luing; we anchored for lunch in Seil Sound – a well known spot where overnighters can visit the Bridge over the Atlantic pub where islanders were able to hire trousers instead of kilts in times when the kilt was banned on the mainland. We then set out towards the Sound of Luing, but knew we would still have to wait further south for the recommended transit time near slack water. At full flood or ebb at springs (which it was) the tide exceeds 5 Kts. 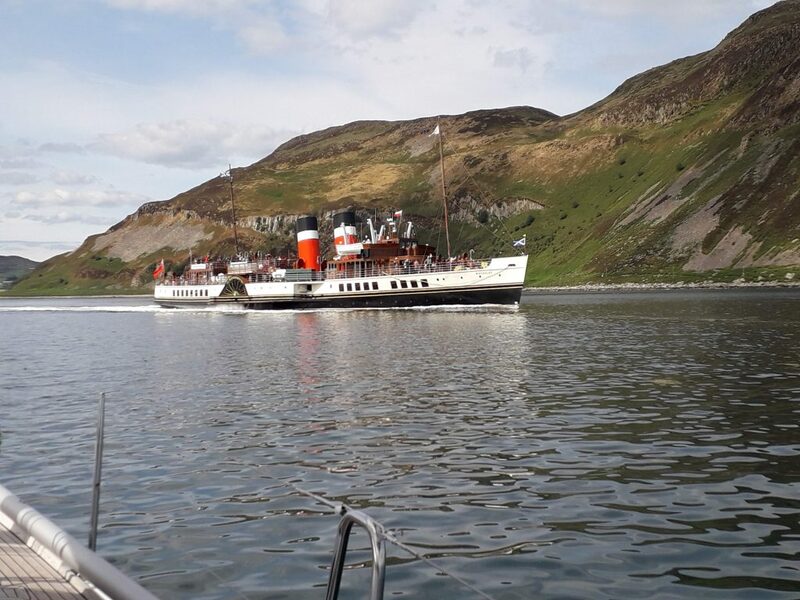 As planned, we therefore headed for Easdale Sound where, when we arrived, we could see there was sufficient room to anchor behind three other yachts. Unfortunately as we were slowly entering this anchorage we hit (more like bounced off than grounded on) an underwater object even though the GPS showed us ample depth in mid-channel. Realising something was wrong, but with no time to work out what, we reversed out on the same course and abandoned any attempt at anchoring. We checked the bilges for any water and thankfully there was none; the boat behaved normally. The nearest marina with any facilities was Craobh Haven, so we headed there in benign conditions through the Sound of Luing. 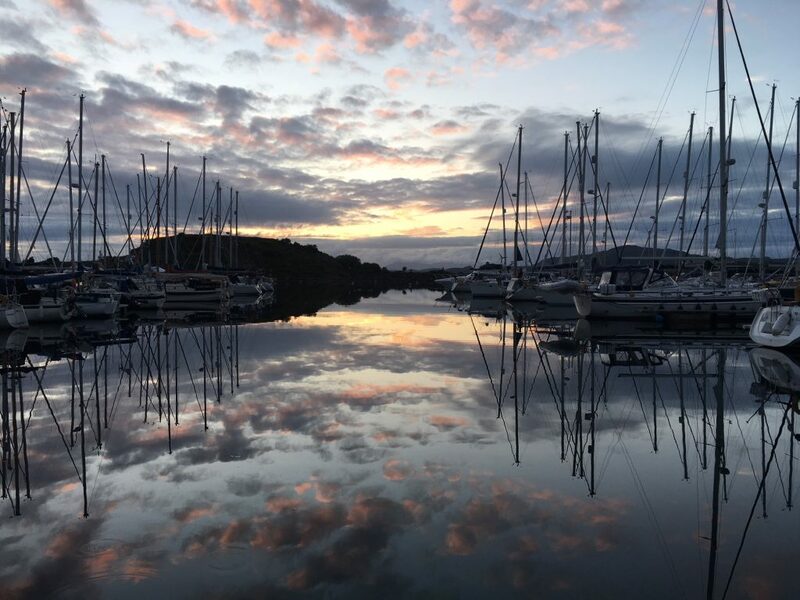 Craobh Haven marina were most helpful and the next morning lent us an underwater pole mounted camera and light which revealed no damage to the leading edge of the keel (but incidentally attracted a lot of fish). When we asked them about Easdale Sound they said that locals know there is a rock there, which is unmarked on the charts and, in addition, visitors also regularly hit a rock in Cuan Sound! The underwater camera gave us some comfort, but we felt we needed the keel and hull checked with a lift-out. The PYC team swung into action; Bosun Richard Ash found both a marine surveyor and a lift-out facility at Port Ellen on the Isle of Islay just 40 NM away and available the next day. Much relieved, we spent the rest of the day in Craobh and were able to replace a missing 5m mark on the anchor chain. We ate at the Lord of the Isles pub that night and were rewarded with stunning views at the late sunset over the Island of Mull and other islands. The following day we set out for Port Ellen, passing the Gulf of Corryvreckan at slack water – infamous for its huge whirlpool – and even then there were mini-whirlpools all over the place – disconcerting for the helmsman who felt something was grabbing the rudder all the time. Flocks of guillemots and gannets – dive bombing fish – were all around us. We passed Craighouse on Jura in a disappointed mood as we had booked a tour of the distillery there some days before, but had to cancel and press on to Port Ellen for the lift out. Islay amazingly has three well known distilleries within a few miles of each other – Laphroaig, Lagavulin and Ardbeg – they say because of the quality of the water, but I think more likely because the coast there is a smugglers’ paradise. At one stage we were led to believe that the lift-out was actually in the Lagavulin enclave, but it was clear from the chart that this was an untenable anchorage for a boat our size. So we headed straight for Port Ellen which is a picturesque harbor with a recently established marina run by volunteers. We were later piloted to the lift-out which was a rather agricultural affair with a tractor that reversed a cradle down a slipway into the sea. The marine surveyor was, however, able to inspect the underside of RelaX and give us the assurance that she was seaworthy for rounding the Mull of Kintyre, sometimes a daunting prospect. The next day we set out to round the Mull, which we did in again benign conditions and with the appropriate music playing. We even saw some “mist rolling in from the sea”. Our next port was Campbeltown – a curiously remote place on the east side of the Mull – and with a lot of not quite right architecture. A new marina was again available, but the stop was otherwise unremarkable, perhaps because the opening time of the distillery did not match the tide timetable. 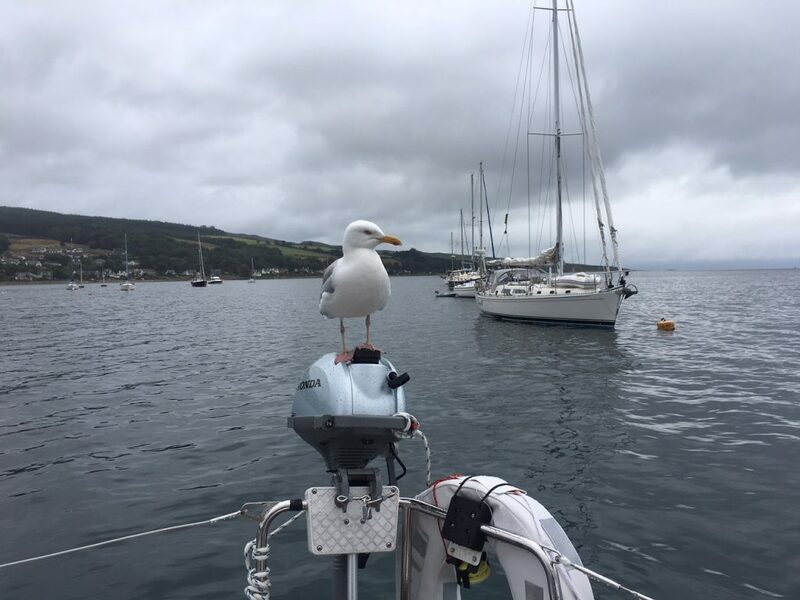 For our penultimate day we then headed to Lamlash on Arran – a small anchorage with visitors’ buoys apparently supervised by a dead ringer for Captain Cat in Under Milk Wood. We were sent scrabbling for our cameras twice, once when the Waverley paddle steamer went past us, and the following morning when a seagull stationed itself on the outboard clearly expecting breakfast. That evening, once we had overcome the outboard’s foibles, we had an excellent seafood meal in The Pier Head. The final day we had significant wind for only the second time in the week, and so made a rapid passage through a quartering sea to Troon. A Dutch tanker captain’s assurance over channel 16 that he had altered course to avoid us helped us on our way when we were touching 8 kts on a broad reach. Overall we were most impressed with Relax even though she is a bit lively in some circumstances. In the light of the shortcomings of the Islay lift-out, a further lift-out was arranged for the following Monday but again found no need for immediate repairs.